The Tower Xplorer 14′ Inflatable SUP has a revolutionary design with 8-inch thickness to provide lightening fast, flat-water performance for cruising or touring. Its 8-inch thickness means this board is extremely rigid and is quite comparable to the more traditional paddle boards. Even though this SUP is 14-feet in length it has the advantage of being easy to inflate/deflate which means it is very easy to store or transport. Extremely rigid – the Tower Xplorer 14′ is built to be supremely stable with the capacity to hold up to 700 lbs. It is stiff and ready to use at 10 to 11 PSI and perfect for cruising or touring and certain to be appreciated by those that love the long boarding session. Highly durable – the military-grade material used to construct this inflatable SUP is highly durable and makes the board virtually indestructible. This means there is less need to be concerned with crack, dings, or moving across the rocky shoreline. Portable – this iSUP is built to be highly portable even though it is quite large once fully inflated (14-ft in length by 32-inch in width by 8-inch in thickness). Once deflated, this SUP can roll up into a compact size similar to a sleeping that makes it easier to transport and store. 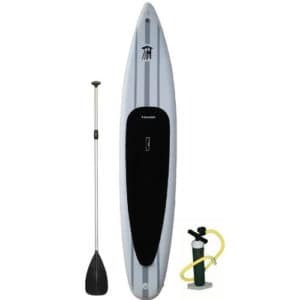 Package deal – the Tower Xplorer 14′ Inflatable SUP is a complete package with everything needed to get water-ready, including a 3-piece, adjustable paddle and repair kit. 2-year warranty – this iSUP has a 2-year manufacturer’s warranty in place. If you really want to know what other paddlers are saying about the performance of the Tower Xplorer 14′ Inflatable SUP, why not take a look at these pros and cons sourced from real customer feedback. The Tower Xplorer 14′ Inflatable SUP has a high 4.6 out of 5 rating on the Amazon marketplace to provide a well-respected board that is great for cruising solo or with the family. It is large and extremely stable with the ability to easily accept a total load of 700 lbs split between riders and gear. With its ability to track well, sit high in the water and paddle really easy, this stand up paddle board is certain to give the desired stability and performance on flat-waters.